The Valley of the Communities in Yad Vashem is a massive 2.5 acre monument literally dug out of natural bedrock. Over 5000 names of communities are engraved on the stone walls in the Valley of the Communities. Each name recalls a Jewish community which existed for hundreds of years; for the inhabitants, each community constituted an entire world. Today, in most cases, nothing remains but the name. The Valley was excavated out of the earth-nothing was built above ground. It is as if what had been built up on the surface of the earth over the course of a millennium-a thousand years of Jewish communal life- was suddenly swallowed up. The names of the communities are engraved on the 107 walls which roughly corresponds to the geographic arrangement of the map of Europe and North Africa. 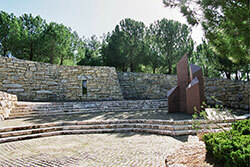 The Valley of the Communities was established with the support of the American Society for Yad Vashem. "This memorial commemorates the Jewish communities destroyed by Nazi Germany and its collaborators, and the few which suffered but survived in the shadow of the Holocaust. For more than one thousand years, Jews lived in Europe, organizing communities to preserve their distinct identity. In periods of relative tranquility, Jewish culture flourished, but in periods of unrest, Jews were forced to flee. Wherever they settled, they endowed the people amongst whom they lived with their talents. Here their stories will be told.."
The Valley of the Communities was established with the support of the American Society for Yad Vashem under the extensive and innovative leadership of its Founder and Chairman, Holocaust survivor and member of the Yad Vashem Directorate Eli Zborowski z”l. Eli was a dear friend who devoted his life to Holocaust Remembrance and to Yad Vashem, working in solidarity and close partnership to commemorate the victims and impart the legacy of survivors. In December 1977, Eli discussed with Dr. Yitzhak Arad, then Chairman of the Yad Vashem Directorate, the need to memorialize all the Jewish communities that were destroyed during the Holocaust. From these conversation came the major endeavor of the Valley. Dedicated in 1992, the Valley symbolizes a world that no longer exists. Located in the center of the Valley is the Beit Hakehilot which provides information about the inhabitants of the communities and the Jewish religious and cultural life that thrived before the war. Our gratitude and thanks is extended to all of the supporters of the Valley of the Communities.